It’s unbelievable but almost a year has passed since the last world championship in Japan has ended and the world championship in Montreal, Canada, is just around the corner! This year, the schedule is a little unusual: The set-up days are Saturday and Sunday and the regular tournament doesn’t start until Monday. Like last year the arrival of the team members happened in chunks: Jessica has already arrived yesterday and used the day to explore the city. Everyone else traveled today: Maike’s flight from Stockholm left at 06:05, Judith, Jasper, Marc, Timon, Niklas and Daniel left Hamburg around 10:10. They re-united in Paris and started the last (and biggest) part of the journey from Paris to Montreal with significant delay, but together. The flight was mostly used to work a little on the software, meet new teams and catch up with some sleep. 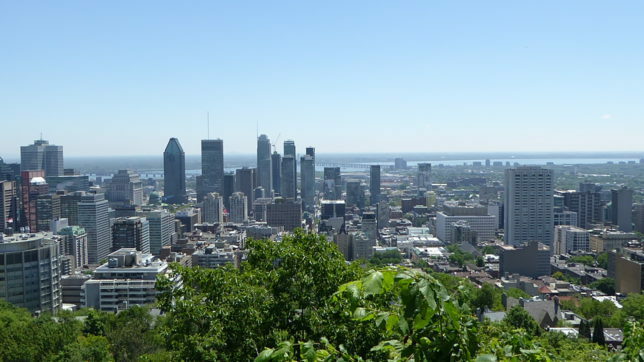 The airport in Montreal was then firmly in the hands of the RoboCup community: Flights from Paris, Amsterdam and Frankfurt arrived nearly simultaneously and brought almost all European RoboCup teams to Canada at the same time. We then made the first experience with the famous Canadian kindness during the trip from the airport to our accommodation. People here are incredible accommodating and you don’t even need to ask for help, you’ll frequently get kind offers of help. Then again everything is very coordinated here: The shuttle buses from the airport had an “instructor” who decided how many people could board the bus. This amount was strictly determined by the amount of seats and luggage space available. What a difference compared to Japan where people got payed to push as many people as possible into one train! We have rented a small apartment a little outside the city center this year. This makes the travel to the competition venue a little longer. However, it also means we are all staying together, we can have breakfast whenever we want, we can cook dinner together (if we have the time) – and of course work as long and as much at night as we want! The first arrival at our apartment was surprisingly unpleasant: The code for the front door was wrong and of course none of us had a Canadian SIM card or data roaming available. Luckily the landlord randomly came by after a little while and the short drama had a quick and happy ending. The rest of the evening was used for a short grocery shopping trip and a quick dinner. Now most team members are already asleep, which is no wonder since it’s already 5 AM in Germany. Tomorrow morning the competition hall will open at 8 AM and of course we want to be among the first to enter. We hope to record some images to train our vision and adapt our walking algorithm to the local turf right away. Much has changed since the last world championship, both when it comes to the software and hardware. The level of motivation in the team is higher than it has been for a long time and thus we’re all looking very much forward to the beginning of RoboCup 2018 tomorrow!